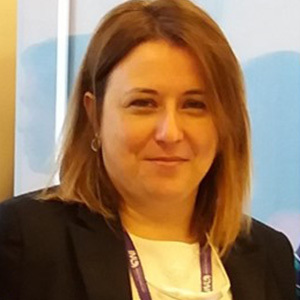 Begoña Espiña is, since October 2016, the Leader of the Water Quality Research Group within the Department of Life Sciences at INL. Dr. Espiña focuses her research on developing portable and remote biosensors and devices based on nanomaterials for the selective capture of water chemical contaminants as well as developing methods for nanomaterials’ fate, bioaccumulation and toxicity with special emphasis in implementing the safety-by-design concept. Begoña Espiña holds both Bachelor (2003) and PhD (2009) degrees in Biology by the University of Santiago de Compostela (USC), Spain. During her PhD she focused on the study of biotoxins’ toxicity as well as in the development of biologically-based sensitive and accurate detection methods for them. Afterwards, she was granted with an Isabel Barreto contract and spent two years (2009-2011) in the Department of Pharmacology of USC as a researcher involved in the technical development and management tasks for two trans-national projects from the Atlantic Area Operational Programme: Advanced Tests about New Toxins Appeared in the Atlantic Area (ATLANTOX) and Knowledge Transfer Network for Prevention of Mental Diseases and Cancer in the Atlantic Area (PHARMATLANTIC). Begoña became a postdoctoral researcher at the International Iberian Nanotechnology Laboratory in September of 2011. N Vasimalai, MT Fernández-Argüelles, B Espiña*. Detection of sulfide using mercapto tetrazine protected fluorescent gold nanodots: The preparation of paper based testing kit for on-site monitoring. L. M. Salonen, S. R. Pinela, S. P. S Fernandes, J. Louçano, E. Carbó-Argibay, M.P. Sarria, C. Rodríguez-Abreu, J. Peixoto, B. Espiña*. D. Rodrigues, M. Bañobre-López, B. Espiña, J. Rivas, J. Azeredo. Effect of magnetic hyperthermia on the structure of biofilm and cellular viability of a food spoilage bacterium. B Espiña, E Cagide, MC Louzao, M Martinez-Fernandez, M R Vieytes, P Katikou, A Villar, D Jaen, L Maman, L M Botana. Specific and dynamic detection of palytoxins by in vitro microplate assay with human neuroblastoma cells. B Espiña, M Prado, S Vial, V C Martins, J Rivas, P P Freitas. New techniques in environment monitoring.